By combining the beauty you desire for your floors with the practical protection you need for your cat or dog, our pet-friendly flooring adds both beauty and value to any home. Come into our store to browse our samples and find hundreds of pet-friendly flooring ideas. When you purchase flooring from our local store, you do not have to sacrifice quality, beauty, or value. Let us come into your home and install the flooring you need today. The majority of households have at least one pet, while many have two, three, or more. As you can see, pet-friendly flooring options are in great demand. When you have a pet, you take this into considering when buying new flooring. The manufacturers are listening to you and providing flooring of all types to meet your needs. The professionals at our flooring store are listening to you, too, and we provide you with pet-friendly floors that offer style and great performance. You can find many types of flooring that can stand up to pets and children in our showroom. Options include laminate, tile, luxury vinyl tile, and hardwood. Or, you may prefer sealed flooring or stain-resistant carpets when you need a workable solution for a house full of pets. Backed by many years of experience, our dedicated team of knowledgeable experts can guide you toward the perfect answers to your flooring questions. Not only do we have comprehensive product knowledge, we have design training, too. Let us help you choose the per-friendly flooring that meets your lifestyle requirements, as well as your decorating preferences. Laminate flooring is manufactured to meet the needs of today’s busy families. Laminate contains a high-resolution picture that looks like a high-end floor covering, such as hardwood or tile. It is manufactured with multiple layers of strong materials that form a durable and strong construction. Laminate flooring resists moisture, so it is a good choice when you have a pet or two. Consider tile as a pet-friendly floor that will meet the everyday demands of your family. 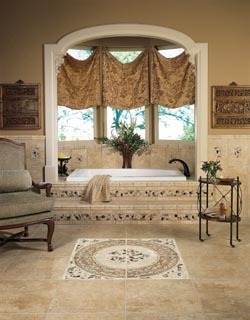 Classic and elegant, tile is tough and resists water and stains. Not only is this long-lasting flooring option friendly to pets and their families, it also boosts your property value. Tile flooring is coveted in homes for its beauty and decorating versatility. Luxury vinyl tile is flooring that is made to look appealing and perform well under demanding requirements. Vinyl comes in different styles that include the realistic appeal of ceramic and porcelain, as well as hardwood plank. These animal-friendly floors are ideal for homes that have high foot traffic, children, and pets. Not only does laminate resist moisture, it wears well even when trod upon daily with paws and toenails. Hardwood is an option for households with pets. We recommend that you choose hardwood that has been sealed to protect it from accidents and scratches. Engineered wood is a type of hardwood that has been altered in the manufacturing process to be pet-friendly. Engineered wood is layered construction made of high-density fiberboard that has been bonded together. As you would guess, this specially sealed flooring option is made with pets in mind. Unsealed and untreated wood floors may not work so well in a home with pets. Something as commonplace as spilled water can damage this type of flooring with stains and marks. Let us provide you with the floors you need to take your pet protection to the next level. Sealed flooring comes pre-treated with specially formulated chemicals that protect it from pet accidents and scratches. Here in our flooring showroom, we understand that your home is your biggest investment, and you take pride in beautiful floors. We sell and install the type of flooring that features both ease of care and stylish beauty. Treated with protective chemicals, stain-resistant carpet repels water and dirt from permanently bonding with the fibers, making it ideal for homes with cats and dogs. Manufacturers use nylon or other synthetic fibers, as well as wool, to make these carpets. As a result, this option offers strength, durability, and toughness. To enhance the stain-resistant nature of this type of carpeting, protective treatments are added. We have a number of popular brands that we can recommend to you so you can enjoy the comfort of carpet flooring in your home. Of course, pet-friendly flooring is only effective when it is properly installed. When you invite our dedicated team of skilled and talented installation specialists into your home, we work to accommodate your busy schedule. We are efficient and focused on creating as little disruption as possible for everyone in the house. Our installers are professionals who follow the manufacturer’s recommendations and industry best practices when placing your new flooring. It is our goal to install your new floors so that they offer long-lasting beauty and durability for every member of your family, including your pets. Plus, our flooring store features top brands and reputable carpet manufacturers, and we work with you one-on-one to find pet-friendly flooring options for your home. When you visit our showroom to discuss pet-friendly flooring, don't forget to ask us about the Pets for Patriots (tm) Program. We partner with this program to find homes for pets while giving loving companions to the men and women of our armed forces. Contact our flooring company for more information about stain-resistant carpet and sealed flooring. We sell and install pet-friendly flooring for our customers in the communities of Longmont, Niwot, Frederick, Firestone, Louisville, Lafayette, Bolder, Gunbarrel, Lyons, and Loveland, Colorado.